Guys might hate asking for directions, but they certainly won’t resist the guidance found in The Last Men’s Book You’ll Ever Need. Author David Moore combines his Bible scholar background with a humorous Dave Barry-esque style of writing that makes sensitive subjects like sexual temptation, love of money, busy-ness, and the shrinking American soul” much easier to ponder and improve upon. And the seemingly playful title is actually based on a strong thread of sincerity. Moore is concerned about the overabundance of spiritual how-to” books that fail to put enough emphasis on the sufficiency of the Bible. One very clear tactic of the Enemy is trying to get us away from the simplicity and purity of devotion to Christ,” he says. 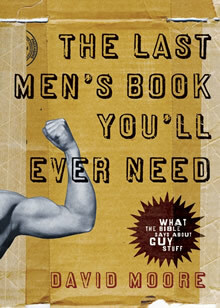 Put first things first with The Last Men’s Book You’ll Ever Need.